Training and lots of love will help calm a pug's anxiety issues. The pug is a smart, loving little member of the toy group of dogs. Though the breed is typically humorous, intelligent and even-tempered, it can also be prone to anxiety issues. If the pug is your canine pet of choice, don't let possible anxiety stop you from owning this wonderful companion canine. Anxiety in any dog is a frustrating problem for his owners, primarily because it isn't always obvious why the pet becomes anxious. 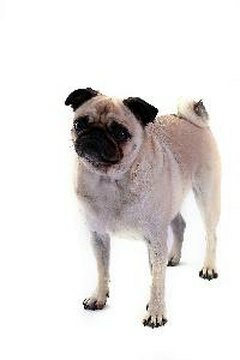 Though any canine breed can develop anxiety problems, small breeds such as the pug are often more prone to these problems because they tend to be more sensitive to stimuli than larger breeds. Various circumstances including neglect or abuse by a former owner, improper training at a young age and traumatic situations at any stage of a dog's life can result in anxiety issues. Barking, growling, rapid breathing, panting, hiding, avoiding humans, trembling and destroying objects are all signs that a pug is in distress with anxiety. Whether you have a puppy or adult pug, recognizing the signs of anxiety will give you the information you need to have your pet evaluated by your veterinarian and develop a plan of action to help make the problem more tolerable or correct it altogether. A variety of circumstances may increase anxiety in a pug. Leaving him alone for many hours each day, making a trip to the veterinarian, having company over to your home and changing your pet's routine are all enough to cause an anxious dog to overreact. Pugs are also extremely sensitive to their owners' moods, so arguments or harsh verbal punishment will only make this little breed's anxiety issues worse. Additionally, an event or object, such as a giving your pooch a bath or the sight of a stray dog, may trigger memories of past traumatic experiences, making a pug slip into an anxiety attack. Anxiety in your pug is no different than if he were experiencing physical symptoms. These emotional issues need to be evaluated by your veterinarian to rule out any possible physiological problems. In addition, your veterinarian will be able to guide you in choosing the best way to handle your pug's anxiety issues, including possible behavior training or the use of prescription medications to help put your pet's mind at ease. Helping a pug to stay calm and decreasing his tendency to be anxious are not always easy tasks. Though giving your pug lots of praise is important, it can also encourage anxiety if you go to the extreme with giving him attention when you should leave your pet alone. Punishment never works, because your dog will become even more anxious if he feels you are angry or threatening. Taking slow, small steps are the best ways to deal with pug anxiety. If you have a puppy, early intervention with a behaviorist or obedience instructor will give you the guidance you need to calm your pet. In addition, it will provide socialization, which is vital to making him feel safe and relaxed in unfamiliar situations. When possible, leave your pug by himself for short periods and gradually increase his time alone to help him adjust to you being away. Using a crate with his toys and comfy bedding will provide a safe place for him to unwind. Positive re-enforcement with praise when he has been a good boy will show him he is loved. The-Pug-Owner-Guide: Destructive Behavior Can Create Major Problems as Your Pug Matures.